Soil processing is perhaps the simplest form of treatment but is also a vital precursor to many ex-situ soil remediation treatment processes. This treatment can reduce the volume of contaminated material requiring further treatment (e.g., ex-situ bioremediation or stabilisation). Selective excavation and stockpiling of contaminated and non contaminated materials reduces the volume of contaminated material requiring remediation. Screening and detailed processing removes solid metals, timber and non-biodegradable materials (plastics, etc) from the soil which can inhibit other remediation processes such as bioremediation. Removal of these items is also required for structural fill requirements (6F2, site won materials, etc) when back filling excavations which are to be built on after remedial works. Screening produces a homogenous soil mass better suited to further treatment. Additionally plastics and metals from the contaminated medium can be recycled offsite. It can also be used to separate and segregate certain soil fractions (e.g., fines) from made ground where perhaps a large portion of the contaminant mass may be present. Selective excavation is a vitally important method of contaminated material reduction, excavation of contaminant hotspots by excavators supervised by an experienced environmental engineer and banksman can significantly reduce volumes of contaminated material by ensuring visually contaminated soils are not stored or mixed with visually uncontaminated soils. 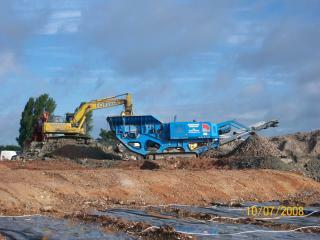 VertaseFLI was contracted for the reclamation of a former landfill located in South Wales. Over 360,000m3 of industrial waste, household waste and soil was excavated and processed using four specialist screening plants along with hand picking stations. Over 325,000m3 of material was separated off, ready for reuse. Over 15,000m3 of material was separated and stockpiled for further remediation (bioremediation and solidification/stabilisation). 31,000m3 of untreatable waste material (plastics, fabric, etc) was disposed offsite to suitably licensed facilities. Separation of 250m3 of asbestos and asbestos containing materials. All remaining materials were recycled for restoration works on site. 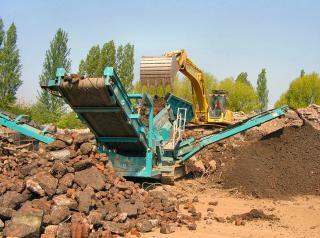 Reduction of contaminated material requiring further treatment. Products suitable for engineering fill. Creates an homogenous soil mass better suited to further treatment. Does not fully remediate all contamination. Further treatment may be required.